Directions: Questions 8 to 9 are based on the following data. 1. Of every dollar received by the federal government, how much (in cents) is from coporate sources? 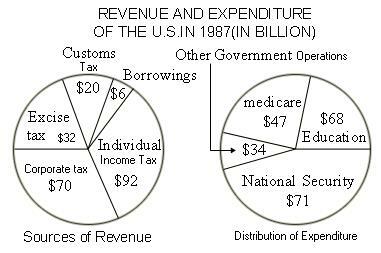 2. what percentage of the federal revenue is derived from borrowings? 3. The percentage per capita expenditure on food registered what percentage decrease between 1973 and 1983 for urban consumers? 4. If the total per capita expenses in an urban household in 1973 were Rs. 531, approximately how much of it was spent on sugar? 5. 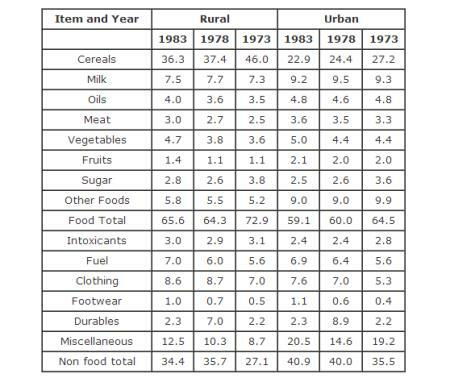 In 1973, in the rural areas the per capita expenses on oil produced what percent of the per capita expenditure on vegetables? 6. In 1978 the per capita expenditure on non food items formed what percent of the per capita expenditure on food items, in the urban area? 7. In 1983, if the rural and urban per capita expenditure were Rs. 665 and Rs. 765 respectively, what was the difference between their per capita expenditure on food items? 9. What is the ratio of glucose to lactose in a mixture as sweet as maltose?